Formalizing opportunities for service-learning is increasingly important to schools of medicine, both for the inherent merits of service-learning itself (for both learners and communities), as well as for accreditation considerations. The Future of Medical Education in Canada (FMEC) report places a strong emphasis on social accountability, and service-learning is integral to carrying out this mandate: “Central to these social accountability initiatives is the provision of a comprehensive education for physicians that will enable them to respond directly to the ever-changing health care needs of the communities they serve” (FMEC, p. 16). Provide greater support to medical students and faculty as they work in community advocacy and develop closer relationships with the communities they serve. Provide students with opportunities to learn in low-resource and marginalized communities as well as international settings. To emphasize student and patient safety in a socially and ethically accountable framework, students should experience adequate training and preparation prior to working in these communities and should have adequate support throughout. (p. 17). As well, service-learning projects can provide students with opportunities to develop many aspects of the CanMEDS competencies in community settings, enhancing our existing classroom and hospital-based curriculum. But what, exactly, is service-learning? There are many definitions of service-learning (one reference points to 147 definitions in the literature) and many interpretations of what service-learning may look like. It’s also helpful to consider this chart (from Marquette University in Milwaukee) which illustrates the differences among community service, service-learning, and internships. Regardless of variations in definitions, service-learning is always a three-part process which incorporates preparation, service, and reflection. Formal, deliberate preparation, which includes consulting with the members of the community who will be served by a project and which may include classroom instruction or another form of mentorship/coaching. A plan, detailing both the intended service and learning outcomes is created. The learner reflects on the process, the service and the learning. (This may occur throughout the project or period of service). The learner provides evidence of learning. (This could be provided in different ways, for example, through written reflections or an interview with a preceptor). Time & Scope: Is this in addition to, or as a replacement for, an existing project or assignment? There may be ways to extend or expand existing assignments to allow for service-learning. How much time can students realistically devote to the project both to make it a success and in light of other academic and personal responsibilities? Goals: How does the project relate to curricular objectives and individual students’ learning goals? How does the project serve the community group or agency’s goals? An individual or group of students may have short-term goals that feed into an agency’s long-term planning: A particular cohort could complete a component of a larger service-learning endeavor with subsequent cohorts carrying on with other components of the same over-arching project. Mentoring & Accountability: How will students be guided and supervised during the project? Is this responsibility shared between an instructor and community member or does one person have the lead? How will students’ learning be assessed and documented? Encouraging opportunities for service-learning should in no way suggest that other, equally-worthy, voluntary service is not valued by the School of Medicine, Queen’s or the wider Kingston community (and other communities in which our students find themselves). However, because of the integrated nature of service-learning, it has the potential to provide unique opportunities for our students and our communities. The Professional Foundations Committee is exploring ways to address service-learning formally in the UGME Curriculum. If you’re interested in incorporating service-learning in your course, the Education Team is available to help with your planning. Please feel free to get in touch. 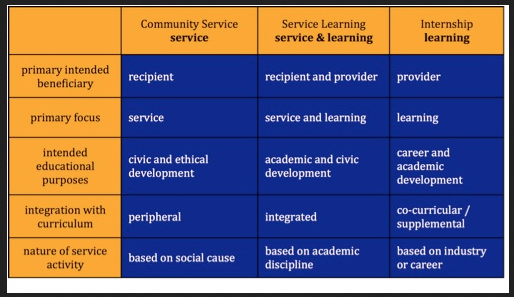 One thought on "Balancing service and learning in service-learning"
Great read Theresa! Such potential for meaningful student learning experiences!